Interior and Exterior protection equal to home security systems, no matter where you are. Secure boats and/or trailers at home, on the road, on land or docked. 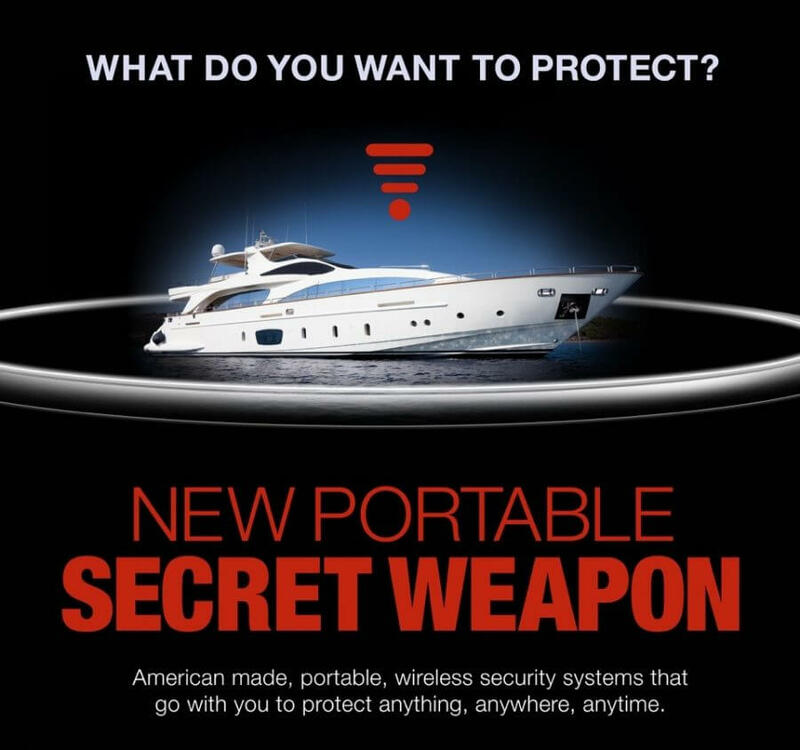 Tamperproof, portable alarm system protects your watercraft where-ever, whenever. Security equal to car alarms. Portable. Tamperproof. There seems to be a notion that Recreational Vehicles (RV’s) or Motor Homes don’t have the same choices for burglar alarms as do stationary homes. RV owners often say, “If I’m constantly on the move, how can I have an alarm system that notifies when someone is trying to break into my RV?” We have an answer to the question – with the perfect solution… The Tattletale! An industry leading portable security solution. Because of its unique features, the Tattletale can go wherever you go and still have the security system that protects your property while you are away. The Consumer Unit, with its built-in motion sensor, is all you need to secure the inside of your RV or Motor Home. Should someone enter your RV, the Consumer Unit’s motion detection will immediately notify you by either text message, email, or both. If you are staying in a location for an extended period of time, you can even have local law enforcement notified of any intrusions. 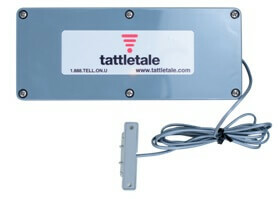 If you wish to secure the storage bay doors, the Tattletale’s door opening sensor can be easily deployed. 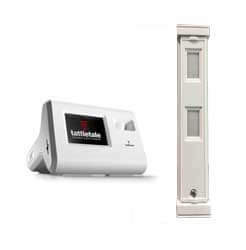 Another powerful feature of the Tattletale portable security system are the variety of sensors available. 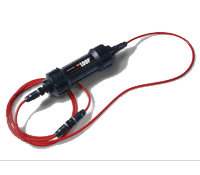 Our temperature sensor monitors the internal temperature of your RV. Imagine leaving your pet in you RV while you are out for the day or evening and the unthinkable happens… loss of power to your internal environment control. The temperature inside your RV will quickly change either by increased heat or cold. 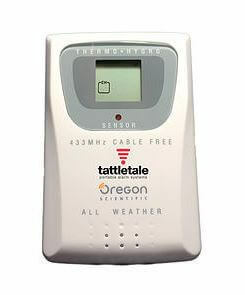 The Tattletale will immediately notify you of any changes to the internal temperature of your RV and give you time to rescue your pet from intolerable and possibly life threatening temperatures. If there is a total loss of power, Tattletale has a 10 hour internal battery backup system. Once again, you will be immediately notifies of any power loss in your RV or Motor Home. Now you can travel anywhere and have with you a powerful, secure, and portable security system. Call eGuarded today and let us tell you more! Our DIY – completely wireless system – sets up in just 60 seconds, making it easy to setup or move anywhere with you. We have been here from the beginning, protecting what protects you and our country. Now that same portable security system protection can be used in your home. 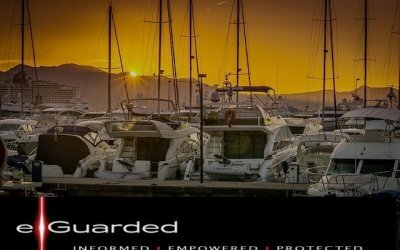 When you read eGuarded’s news section, there are a number of articles about the theft of boats or a boat’s expensive electronics. 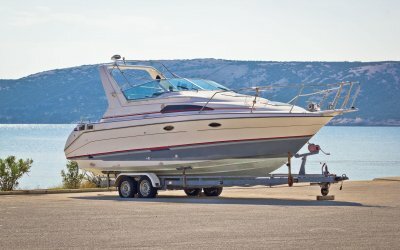 If thieves are bold enough to enter your home, they are certainly bold enough to board your boat. In many cases, thieves will just untie the docking ropes and sail off without a sound. Many times, thieves make their approaches from the water, not through a backyard or other land approach. 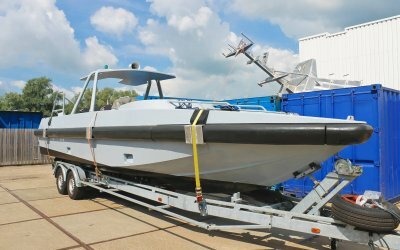 Now you are able to secure and monitor your boat with our feature packed portable security system. 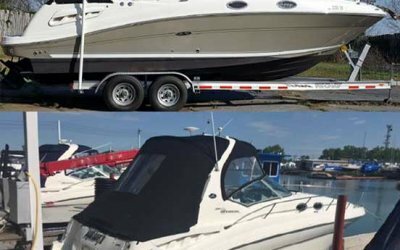 With its corporate offices on the west coast of Florida, eGuarded is well aware of the problems boaters face with securing their valuable assets. Many boat owners are only in Florida during the winter months and then return to their northern homes. 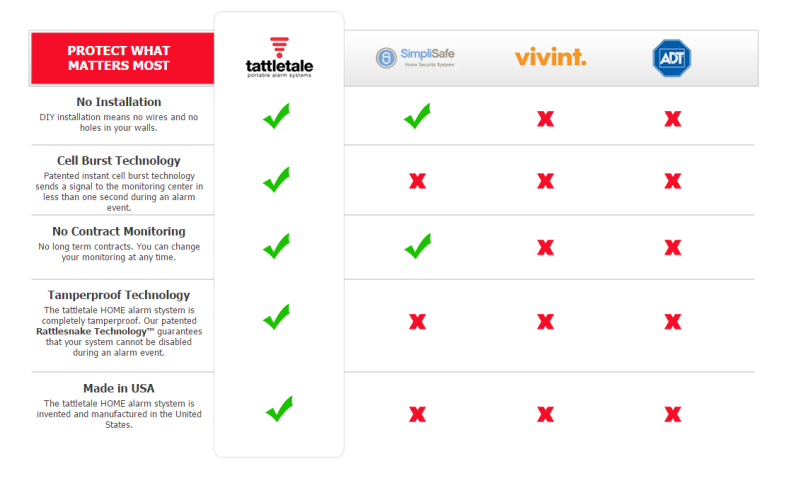 Who or what is watching their boat… and their home.The portable security system by Tattletale is part of the solution. Tattletale’s unique features offer a variety of sensors that will give you a peace of mind that your boat is being guarded. One of Tattletale’s sensors, The Loop, is like an electronic chain. The Loop can secure your boat to a fixed object on land and securely attached to your boat. Should someone attempt to steal your boat, they would have to cut The Loop causing an instant alarm activation. You will be immediately notified via text message or local law enforcement will be immediately notified, or both. The sound and strobe light emitted by the tattletale when activated will surely cause a thief to think twice before continuing their criminal activity. Another powerful addition to the TattleTale portable security system is the Water Level Sensor. Imagine your automatic bilge pump becoming disabled and your boat starts taking on water. Certainly, a bilge pump alarm may be activated; but, if no one is around to hear it you’ve got yourself a new submarine. The Tattletale Water Level Sensor will immediately notify you, no matter where you are, that your boat is taking on water. Call eGuarded today and let us tell you of other ways to secure your boat so you can have the peace of mind that a valuable asset is being guarded… no matter where you are! Our patented Rattlesnake Technology takes picking up or moving the device out of the equation. 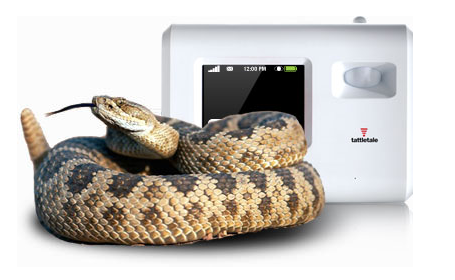 Our patented Rattlesnake Technology takes portable, wireless commercial security to the next level. Because of Rattlesnake Technology the tattletale cannot be tampered with once it is activated. As soon as it is triggered, Rattlesnake Technology will contact you or authorities in just six tenths of a second. A network of portable, wireless security allowing sensor placement up to 300 ft. away. With technology that protects nuclear power plants, Black Hawk helicopters, and the United States Constitution, tattletale’s dependable security relies on HALO Technology. Only tattletale can give you 300 feet of unbeatable protection. Able to incorporate 50 additional sensors into its system, HALO Technology can protect it all. Sixty second setup, anywhere with wireless technology and simple set up. Sensors can be placed up to 300 feet from the base unit – perimeter protection that communicates through walls. Thirty foot, 90 degree built-in infrared sensors provide motion detection in every unit. Customize your unit with up to 50 separate sensors over a 300 foot radius. Add smoke detectors, motion sensors, door and window sensors, glass-break detectors, and more. Patented Rattlesnake Technology prevents tampering and attempts to disable, alerting authorities instantly when triggered. Unplugging the tattletale doesn’t stop it. Rechargeable batteries keep protecting your valuables up to 20 hours. Receive texts and/or email alerts from the unit to multiple recipients. Keep ‘high target’ areas protected even when the unit is disarmed. Provide visual and auditory deterrants with lights and siren alarms. Restrict detection zones to non-pet heights for property where pets are roaming. Free text and email alerts for 30 days. Upgrade to police and fire monitoring, with live 24/7 operators. Convenience in the palm of your hand: arm, disarm or utilize the panic button from a key fob. 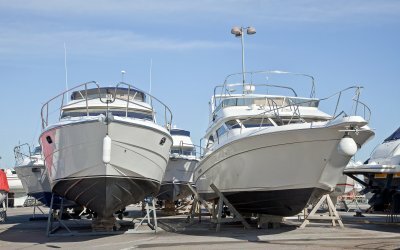 Boat theft is frequent – but also preventable!